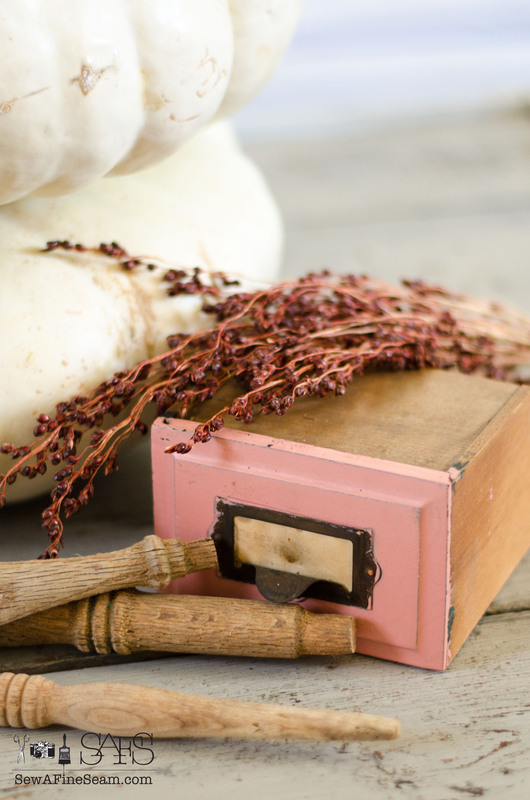 Today I’m going to share how a vintage desk drawer becomes fall decor. I have this uncle. He’s a really great guy and he has this love-of-junk gene that he inherited from his dad. His Dad was my Grandpa. My Grandpa loved old junk. He collected it, saved it, stock-piled it, and I’m sure he had grand plans in his head for what all he was going to create with it. Grandpa didn’t ever get all his junk used up and I now have some of that junk and am very happy to have it – I call it ‘junque’. My uncle inherited that gene and has accumulated a pile of junk himself – I call his ‘junque’ too cause it’s some seriously drool-worthy junk. And like his Dad (my Grandpa) he hasn’t fixed up, or created stuff with all of his piles he’s accumulated. 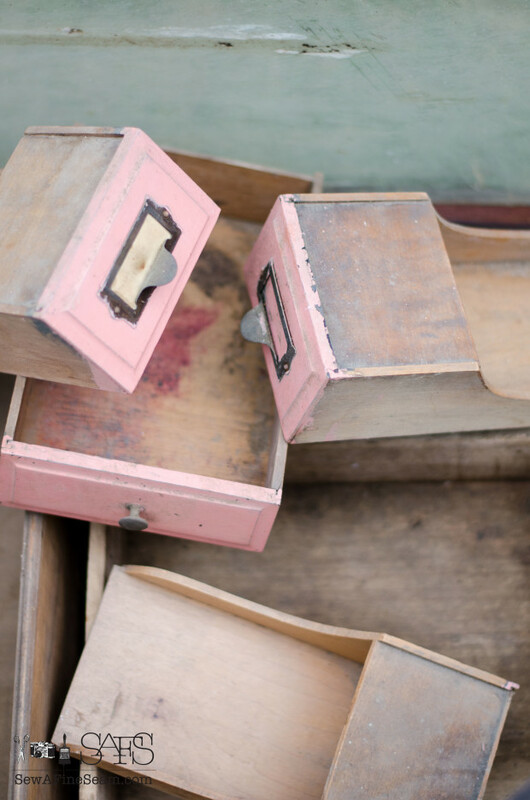 These old spindles and this cute little drawer were in the pile. I spent an hour or so and 4 buckets of hot soapy water cleaning up the stuff I brought home with me. And then since I hadn’t done anything at all for my Junk Visionaries blog hop this month, and the hop was due in less than 2 days, I decided a truck load of drool-worthy junk was the perfect place to start on my ‘project’. 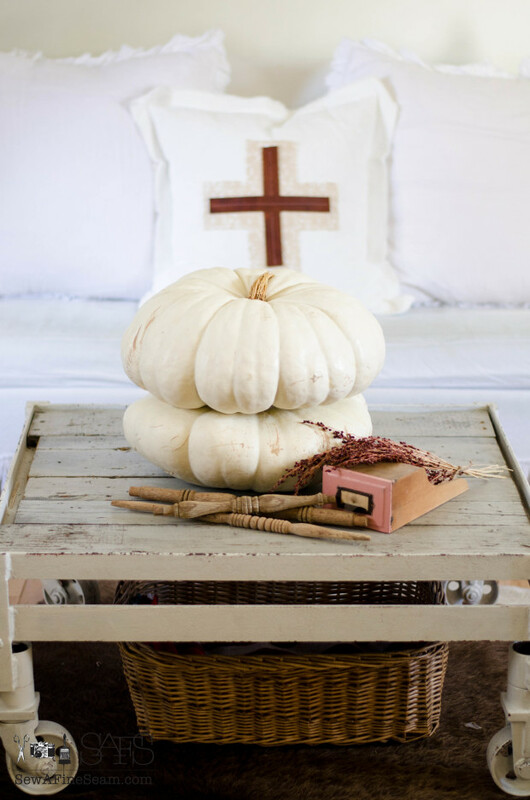 I use the word project loosely because I didn’t really MAKE anything I just pulled some things together to create a fall display on my coffee table. The desk these drawers came from was an old roll top that had been painted pink at some point of its life, and was past the point of being rescued and put back together as a desk. I salvaged the drawers I could, including the BIG ones, the pull-outs used for writing letters, and the bottom part of the roll top. I plan to do something really fun with it. 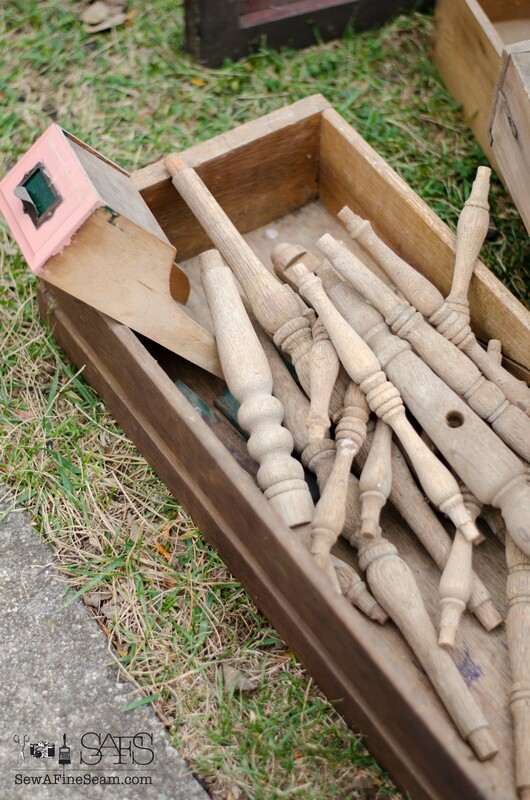 There were a ton of old spindles so I grabbed them too. And some other fun stuff too! Our category this month as Junk Visionaries was to take a thrifted or roadside find and use it to create some holiday decor – an ornament, a centerpiece, something. 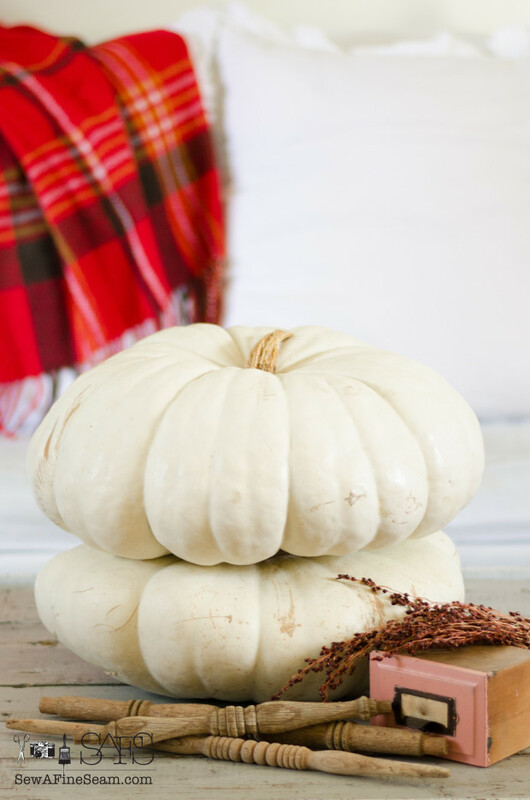 I had a lot of directions I could have gone, and really I thought I’d do something for Christmas but I had these white pumpkins from a few weeks ago when I did my Fall Picnic shoot so I pulled together a Fall display instead. Isn’t this drawer cool? It is so unique the way it is made. You could almost use this drawer for a large scoop. I like how the dried broom corn looks with it. This display seriously took about 15 minutes max – to arrange and photograph. 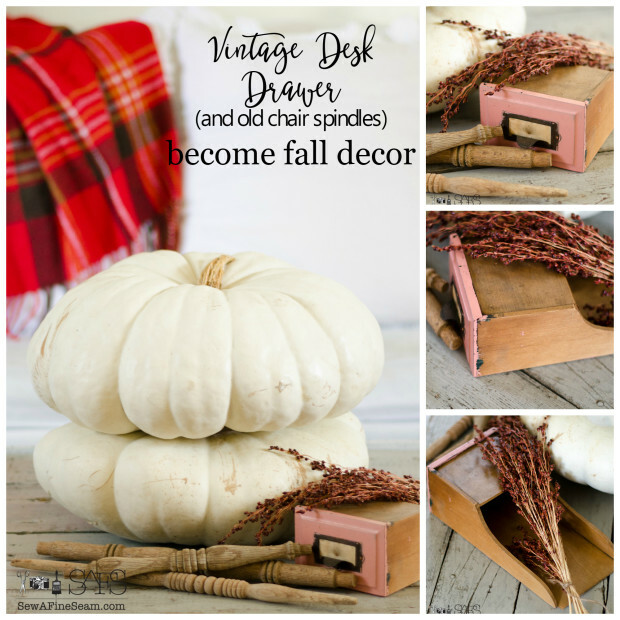 I love how easy and fun it is to use old stuff to create a vignette or centerpiece. The addition of natural elements is always the icing on the cake too, I think. I’m sure my friends have come up with some really fun stuff too – cause like me and my uncle and my Grandpa they love junk too! So head on over and see what they have to share! AHhhh, what fun! If I had a barn I know I’d fill it up with chairs! I gravitate towards old chairs and am always dragging another one home! You pictures alone are drool worthy!!! What a great set up! I’m SO jealous of your truck load of junk! And how fun going through it all! Awesome job. I am so blessed Sara – my Uncle has the best ‘old junk’ and I was so thrilled when my Aunt asked if I wanted to go through it! 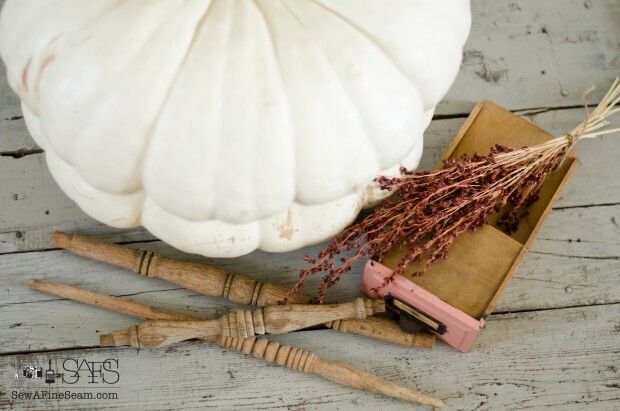 I love the way you incorporated these great piece into a great fall setting! Thank you Tammy! I love how this came together! Thanks Lucy, and good luck with that paint color – it’s a super fun vintage-y pink! doggone it why don’t I have some junquey relatives? Guess all ours would say I’m the junquey person. With a shed full of “stuff”. You will have so much fun using your junque from your uncle, lucky you girl. Your photography is awesome Jill. Seems like I’m right there seeing it. Your vignette is awesome. i love to see what you think up up and how you do it. You have great house for all your ideas. I’d better get my shower, had to turn heater on in there, too chilly otherwise. We were so fortunate to find a brand new heater at Goodwill for $6.99 few weeks ago. Heaters aren’t cheap at all. We also found two ceiling fans this summer for rooms we needed them for. Thank you so much thrift stores, saved us a bundle. Glad you got a good heater! I was thrilled to get to dig through my uncles barn – can’t wait to go back for another load! Such a great story and I am slightly jealous of the piles you get to rummage through. This setting is delicious and the pink it a great warm color for Fall. Simplicity at it’s best! Happy face here. 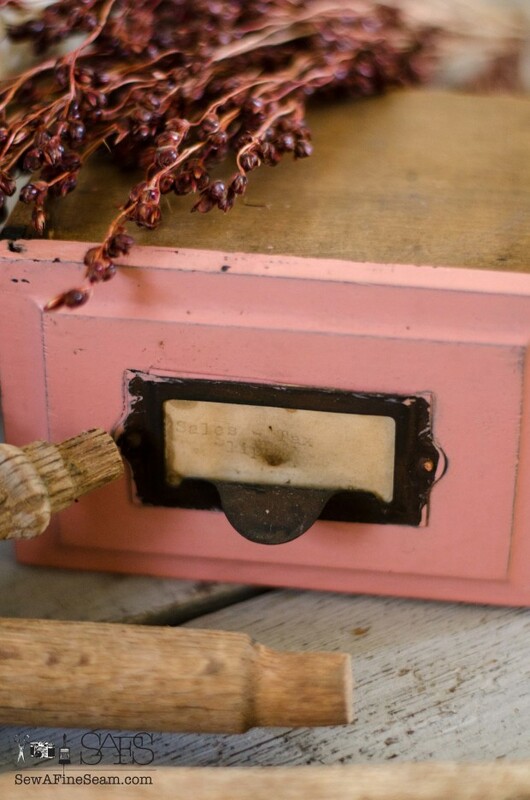 I love the little pink drawers. I have some similar to them and hadn’t thought about painting them. I use them for my business cards when I go to shows. That is an awesome way to use them! 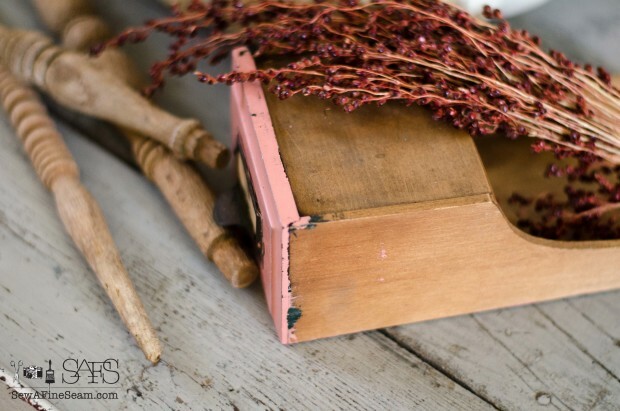 Those vintage drawers are hard to come by these days, but they’re so charming, right along with the old spindles. It must be some of that original patina. 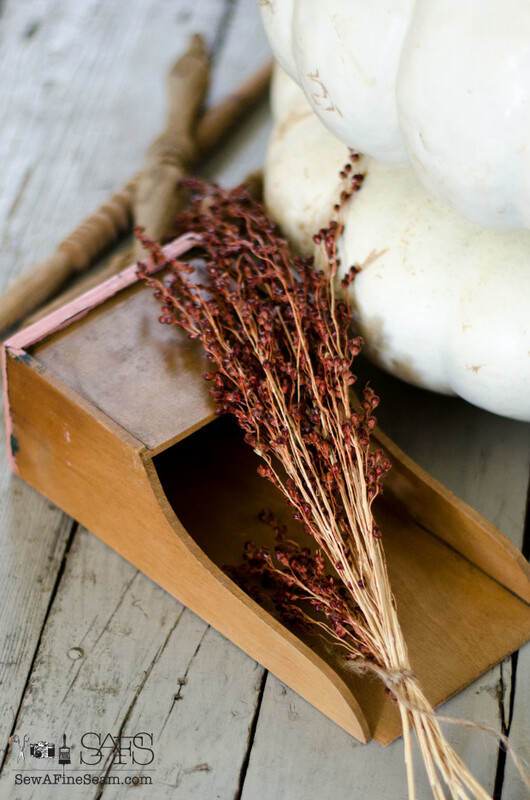 Love how you used these in your table top arrangement. It’s inviting enough to make you want to pick the items up and give them a closer look. Thank you so much Amy! I love the drawers and the spindles too – I agree that original patina is such a draw for me! How fun! It looks lovely! That drawer is very cool! 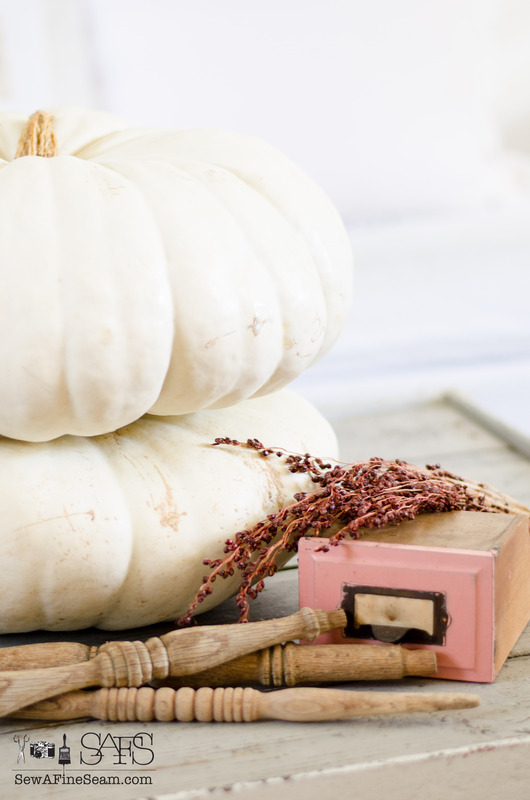 It goes perfect with the pumpkins. I really liked it with the pumpkins too. You should see all the cool stuff in Uncle D’s barn!